This quilt represents 100% play! I had no pattern, no sketch. I just played with fabric, hearts, ribbon, words and even quilting. I used a Hearts Sonnet pantograph and love how the hearts and music notes complete the quilt! This was truly a liberating finish that makes me smile! 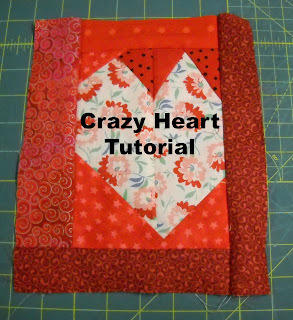 As part of my February Goal I also wanted to create a Crazy Heart Tutorial. This quilt was made in celebration of our 25th wedding anniversary. I love ya babe! Oh! and it's safe to go back into the studio...it's no longer littered with scraps of pink, red and white. It's actually clean...for now! thanks a bunch for stopping by to see mine. What a wonderful quilt, Val! So fun and happy. What a beautiful 25th anniversary quilt! Congrats - it's fabulous! Beautiful quilt Val. I am always amazed at the beauty hidden in our scraps bins! And congratulations on 25 years. I love this Val... It's so vibrant and fun! Congratulations on 25 years of wedded bliss! And on such a beautiful finish. Love the pieced backing. And Buddy! You did it! And I just love it. Congratulations on 25 years and what a special way to remember it. It really turned out wonderful. Congratulations on a job well done and 25 years of bliss. I love it! So, so cute and so scrappy. You did a wonderful job, Val. I think that polka dot binding just right for it. Congrats on your 25th! I got the polka dot fabric as a free end of bolt special....YAH!!! I contemplated a solid binding, but went with the fun one instead!! I'm glad I did. Happy Anniversary! So funky and fun... you can see the freedom in all the blocks. I am celebrating my 25th as well this year and you have planted a seed!!!! It never even occurred to me to make a quilt to commemorate our special day! Gotta get on it-it is Sept 2nd!! I LUV LUV LUV this quilt! it has all my fave things- improv piecing, words, red, scraps and hearts!!!!! ps Congrats on your special anniversary as well! I love your quilt! Thanks for the tutorial, I'll make some hearts later. February is the LOVE month and you've outdone yourself with this one cuz I love, love, love it! Seriously cute, fun and fresh is all I have to say. Thanks for the inspiration I sure could have used some of those pink scraps for my RSC blocks this month. Hopefully I'll have more to work with in March. What a amazing quilt. 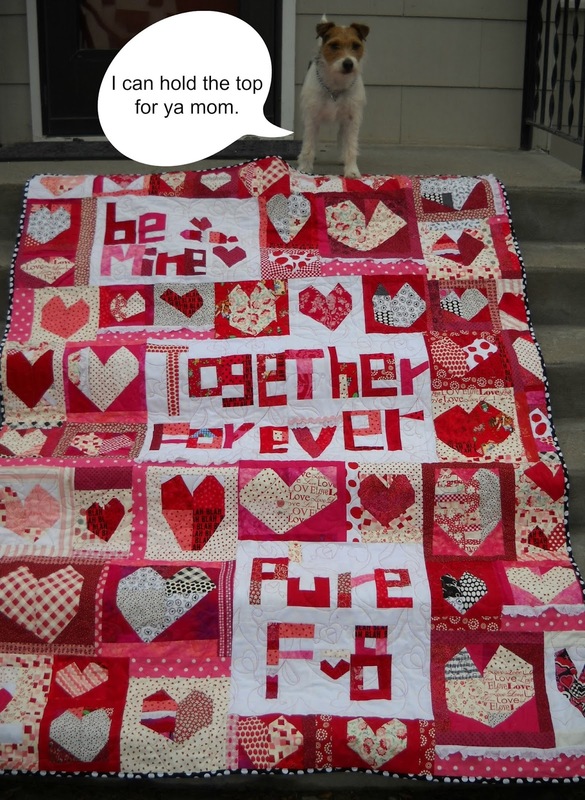 It is fun to make quilts with fun sayings on them. The Hearts are cute too. It looks great, that's fantastic that it is made out of scraps. Well done for creating a tutorial as well. Thanks for linking up! What a lot of work and love has gone into this quilt - a fitting tribute to mark your special history -well done! That is beautiful! How fun that you used scraps and came up with such a great quilt. Congrats on your finish. I just love this Val! The words, the wonky hearts, everything! It is so great that it's from stash, and that you were able to just visualize it and then make it come to life! I can tell you had a lot of fun creating this lovely quilt Val! Thank you for sharing it with us! Wow, Val, it's hard to believe that this quilt was all play and no plans. It looks thoroughly thought out. I was surprised that it was made entirely out of scraps, as it doesn't look too scrappy, everything looks like it was chosen for the occasion. I love the meaningfulness of the quilt, too. Congratulations on 25 years. Your beautiful quilt just oozes fun and happines and dare I say it...oodles of love! How amazing that it is fashioned completely from scraps! Love, love, LOVE it!! Neat. A fun tribute. Great colors and creative. Glad you brought it back. Cute, cute, cute!!! I love Tuesday archives! Fun Events Coming in March! How do I quilt this? DONE! How do I quilt this?? Quilting Acronyms & GYB 2014 Give-Away Winner! I'm A Farmer's Wife Dropout!